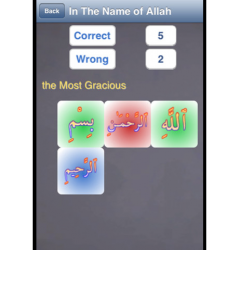 Some new to Quran recitation have difficulty recognizing where a word begins and ends. This App places each word from verses of chapter 112, 113, and 114 as a separate button. Learner familiarizes with phonetic sounds and recognition while pressing words in correct sequence. This Application is discontinued. After discussion with a teacher of Quran, found this format of shuffling words and phrases inappropriate.